Nancy Clark is an internationally respected sports nutritionist, weight coach, nutrition author, and workshop leader. She is a registered dietitian (RD) who specializes in nutrition for exercise, health, and the nutritional management of eating disorders. She is board certified as a specialist in sports dietietics (CSSD) and a certified WellCoach. Nancy’s private practice is located in Newton Highlands, MA. She offers one-on-one nutrition consultations to both fitness exercisers and competitive athletes, coaching them on strategies to eat wisely, enhance energy, optimize performance, and manage weight. Her more renowned clients that have relied on her expertise in diet for sports conditioning to gain a competitive edge have included members of: Boston Red Sox, Boston Celtics, Boston Breakers, Boston College, and many collegiate, elite and Olympic athletes from a variety of sports. Nancy completed her undergraduate degree in nutrition from Simmons College in Boston, her dietetic internship at Massachusetts General Hospital, and her graduate degree in nutrition with a focus on exercise physiology from Boston University. 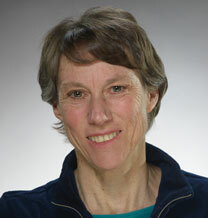 She is a Fellow of the Academy of Nutrition and Dietetics (formerly the American Dietetic Association), the recipient of their Media Excellence Award, an active member of the Academy’s practice group of sports nutritionists (SCAN), and recipient of SCAN’s Honor Award for Excellence in Practice. Nancy is also a Fellow in the American College of Sports Medicine (ACSM) and recipient of the Honor Award from ACSM’s New England Chapter. Nancy’s contributions to runners in the Boston area culminated in her receiving the Will Cloney Award. 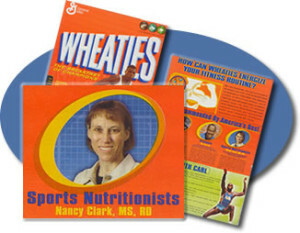 Nancy also holds the honor of having her photo and advice on the back of the Wheaties box for their 2004 Olympic series. She is a member of the Mizuno Advisory Staff. Clark is the nutrition columnist for New England Runner, Rowing, and American Fitness . She is a frequent contributor to Runner’s World and has been on the advisory board for SHAPE magazine. Clark also writes a monthly nutrition column called The Athlete’s Kitchen, which appears regularly in over 150 sports and health publications and websites, including Active.com and MomsTeam.com. Nancy is the author of the best selling sports nutrition reference Nancy Clark’s Sports Nutrition Guidebook. Over 500,000 copies of this classic book have been enjoyed by health professionals and exercise enthusiasts alike. Her Food Guide for Marathoners: Tips for Everyday Champions and Food Guide for New Runners: Getting It Right From the Start help novice runners and walkers go the distance with energy to spare. And her Cyclist’s Food Guide: Fueling for the Distance (co-authored with Jenny Hegmann, MS, RD) helps both beginning and experienced cyclists optimize their performance. Food Guide for Soccer: Tips and Recipes from the Pros, co-authored with Gloria Averbuch in conjunction with Women’s Professional Soccer, helps soccer athletes have the winning edge. Sports and nutrition are personal as well as professional interests. A former member of The Greater Boston Track Club, Clark has competed at the 10 Kilometer, half marathon, and marathon distances. Clark routinely bike commutes and enjoys bike touring. She has led many extended bike tours, including a Transamerica Trip and other tours through the Canadian and Colorado Rockies. She has trekked into the Himalayas and planned the high altitude menu for a successful expedition. Her newest sports are rowing (crew) and yoga. She and her husband, son and daughter live in the Boston area.